Life’s avalanches can bring us to our knees. Just when we least expect it, a mound of snow shoots out of nowhere, making us tumble and stumble down our path. No matter how careful you are, curveballs are going to come your way. In fact, the more fear you put into your life, the more opportunities you have to experience it. When we move from fear to love, uncertainty to trust, terror to joy, we have the ability to handle those avalanches a lot better. Our patio table had no such luck. Exposed to the elements all winter, it stood still in a staunch position, minding its own business, but not going anywhere really. Its stasis, and its later demise, is quite symbolic for what happens when we don’t embrace change in our lives. 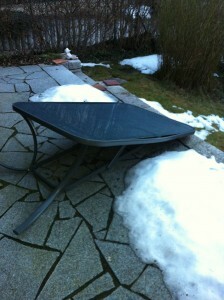 Had we moved the table just one meter away, it would not have met its death as it did when, on a particularly warm morning, a ton of snow slammed it to the ground. We could have prevented it if we had taken action sooner. So many times we are distracted by life’s demands. We can’t think of everything and that’s okay too. I quite like the table bent that way. It reminds me that everything transforms and that no one gets out of this life alive. A few bruises are to be expected after all. And how much more interesting life can be when you can show off your scars because each and every one has a story to tell. And that story, my dear one, is you.